Basic Instrumentation for Engineers and Physicists provides information pertinent to the fundamental aspects of instrumentation and measurements. 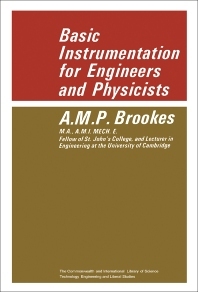 This book discusses the method of building up an instrumentation system. Organized into eight chapters, this book begins with an overview of the instruments designed for use by human operatives that are usually of the visual reading type. This text then examines the common methods of length measurement by means of scales and by means of gauge blocks. Other chapters consider kilogram as the internationally recognized fundamental unit of mass, which is defined by a standard mass known as the International Prototype Kilogram. This book discusses as well the importance of precise determination of time. The final chapter deals with the assembly of apparatus appropriate for the measurements that have to be made in carrying out a specific project. This book is a valuable resource for engineers, physicists, scientists, students, and research workers.